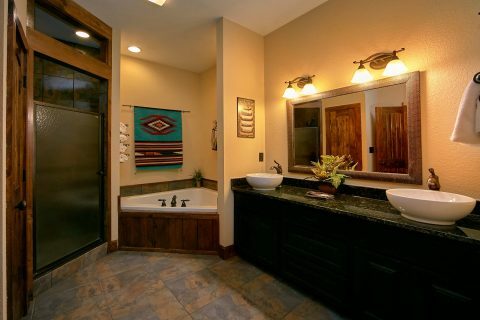 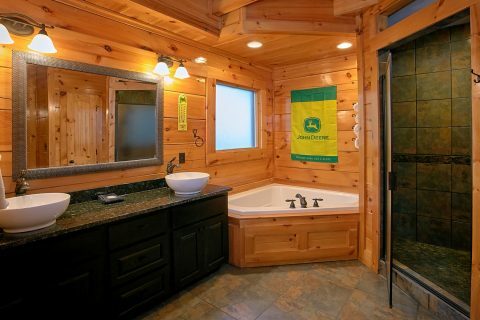 Looking for a beautiful cabin with incredible amenities? 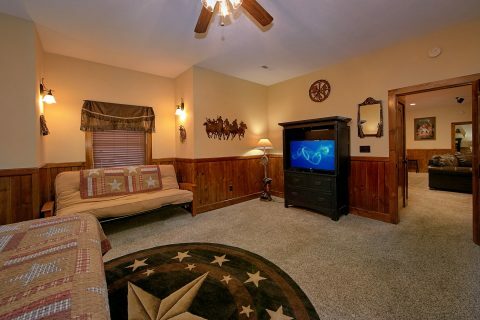 Look no further than "Alpine Mountain Lodge" in Alpine Mountain Village Resort! 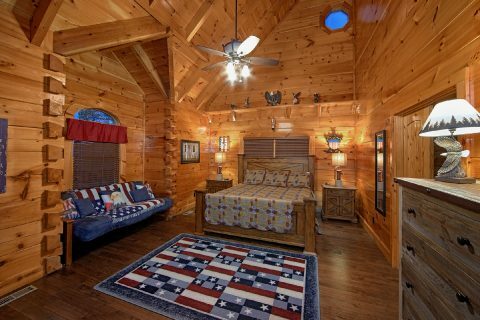 Formerly known as "Chateau Relaxeau," this premium cabin by Cabins USA has everything you need to unwind during your stay. 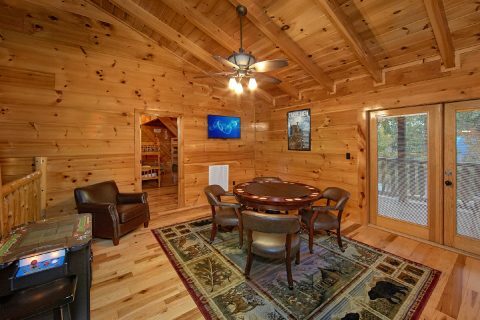 With room for up to 20 guests and 6 bedrooms, this group cabin in the mountains has plenty of room to bring all your closest friends and family together in the Smokies. 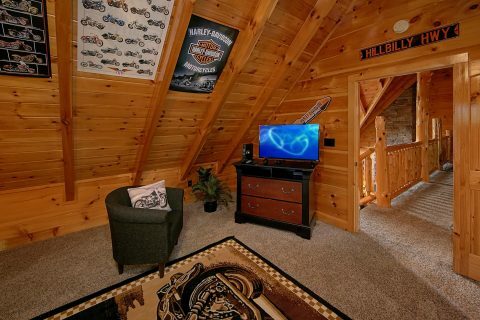 As an added perk, this cabin offers plenty of level parking space for guests in a picturesque resort setting. 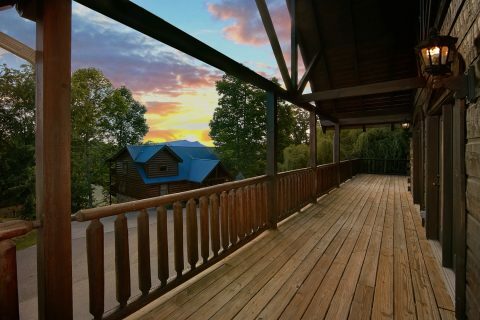 With a spacious deck, access to a resort walking trail, pavilion, playground, and access to two resort pools, this rental also has plenty of ways to enjoy the great outdoors. 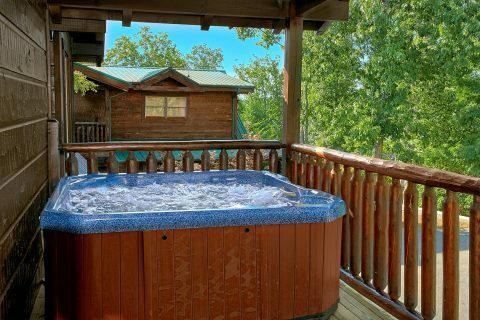 Whether you're relaxing in the hot tub or cooking up some delicious food on the gas grill, this cabin lets you enjoy the outdoors to the fullest! 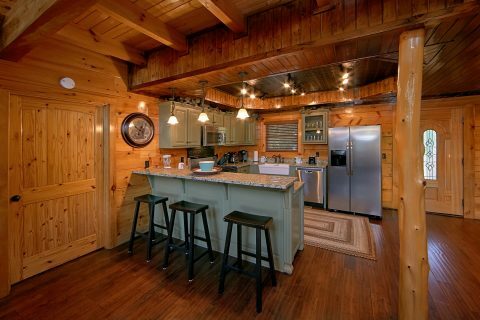 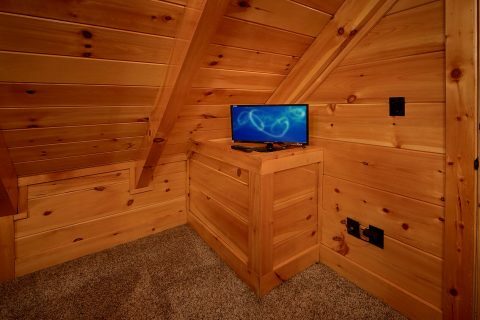 This luxury cabin also boasts a great location near some of the biggest attractions in the Smokies. 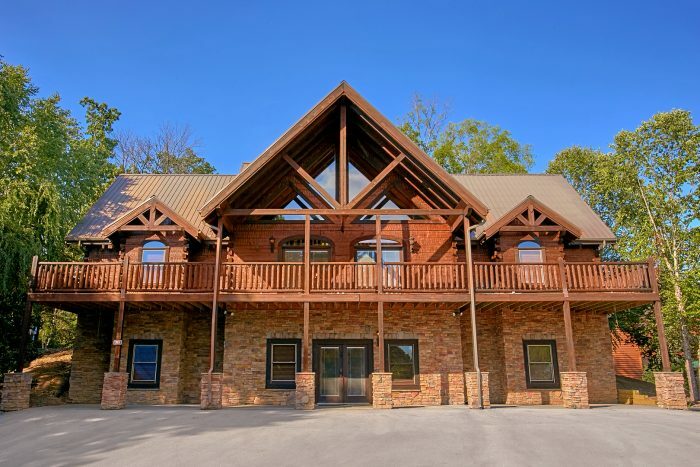 With Dollywood, the Old Mill, the Titanic Museum, and the Tanger Outlet Shops only a short drive away, you'll have no shortage of great things to see and do during your stay! 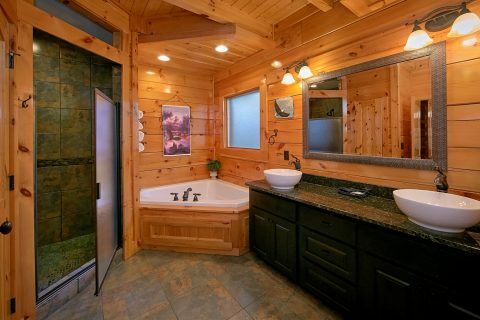 When you enter into this cabin's lovely main level, you'll be glad you reserved a cabin with plenty of space for everyone to relax and unwind. 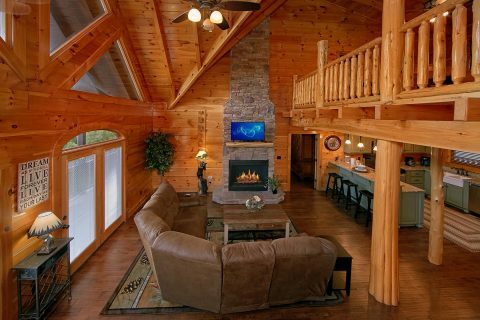 With an open floor plan, plenty of comfortable seating, lofty ceilings, large picture windows, and a gorgeous floor-to-ceiling stacked stone gas fireplace, the living area is perfect for spending time with the people who matter most. 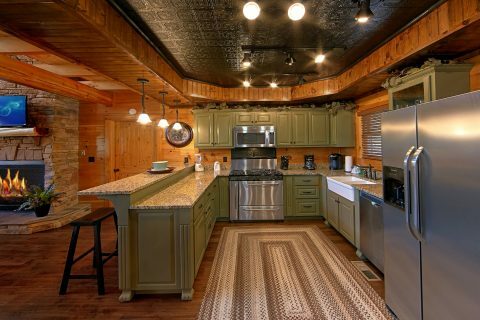 Nearby, you'll find a fully-equipped kitchen with stainless steel appliances and a breakfast bar. 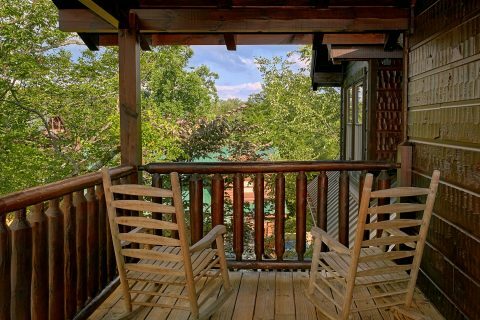 From here, you can step outside onto the deck to sit back on a porch rocker to feel the crisp mountain breeze. 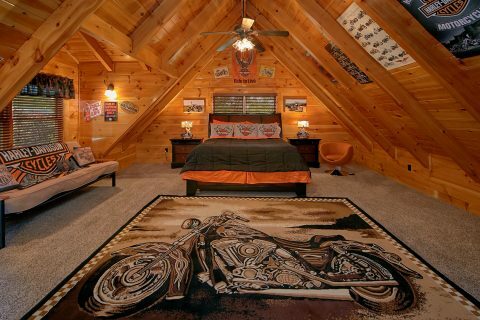 Lastly, the main level features 2 king-size bedrooms. 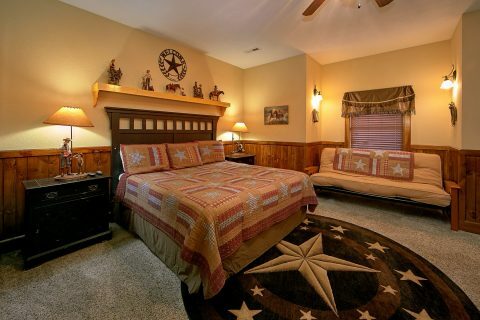 Both rooms each offer a futon for extra guests. 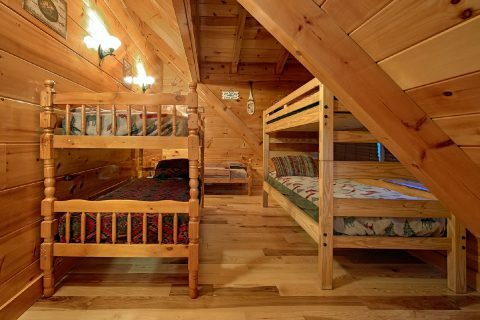 On the cabin's upper level, you'll find another king-size bedroom with a futon and a bunk bed room with 5 twin beds. 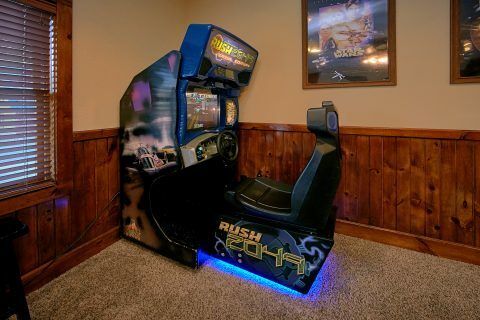 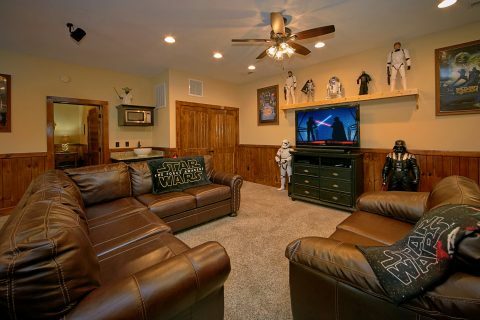 Downstairs, there's plenty of space for entertaining. 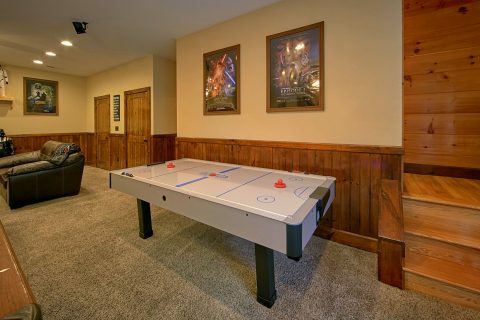 Your cabin's game room features a pool table and air hockey table for enjoying some friendly competition during your stay. 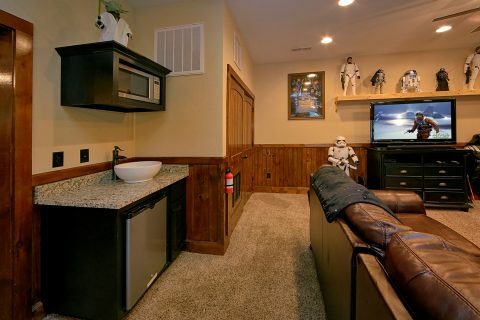 There's also a large television, a sitting area, and a wet bar with a bar fridge for enjoying snacks. 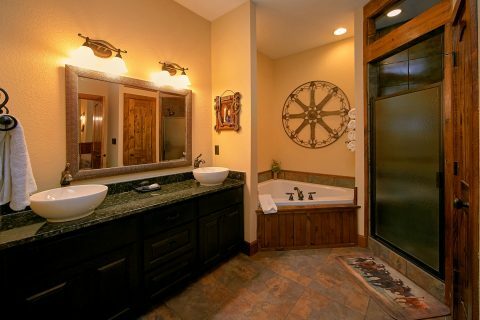 Lastly, this level features 2 king-size bedrooms with jacuzzis and full bathrooms. 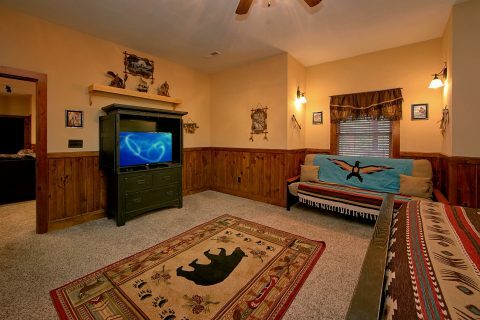 Both of these rooms feature futons for extra guests. 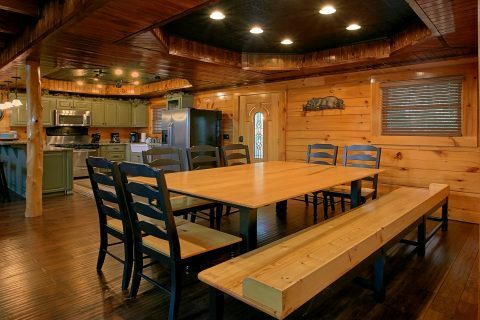 Planning a big cabin vacation to the Smokies with lots of guests? 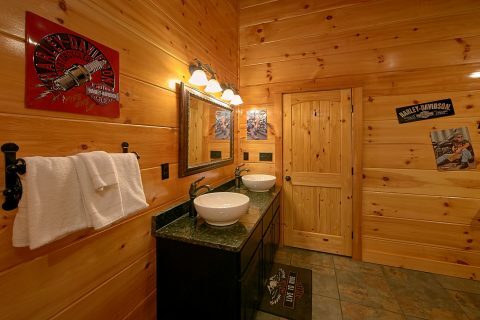 This cabin is located a short distance from another beautiful group cabin, "C'Mon Inn." 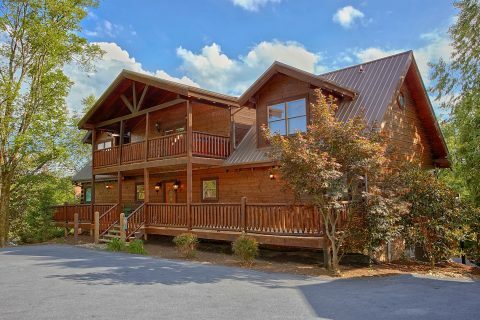 If you're interested in reserving multiple cabins for your trip, don't hesitate to call our reservations office and one of our vacation specialists will help you plan a great getaway in the Smokies! 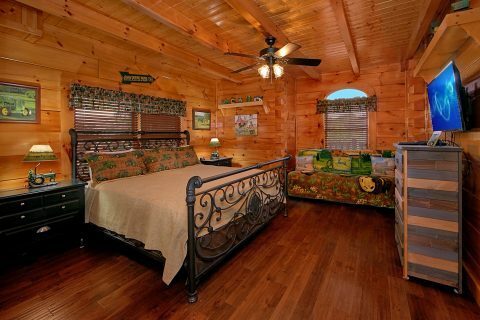 Want to save money on your luxury cabin vacation in Pigeon Forge? 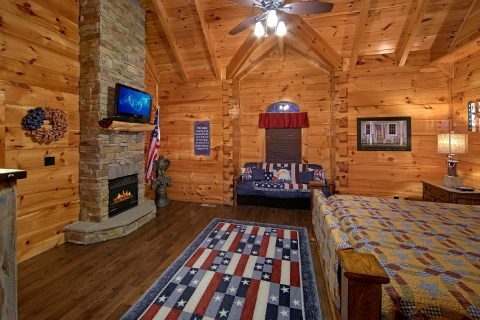 Simply reserve this luxury lodge with Cabins USA to earn a 15% discount on your stay!